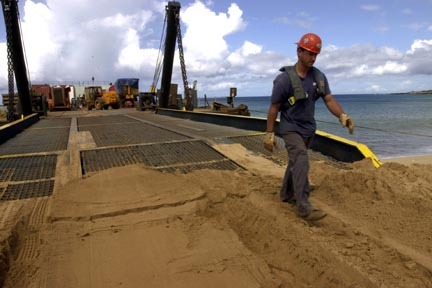 Workers load equipment, vehicles and personnel aboard the barge Beach Bear yesterday morning on Kahoolawe Island. The Navy is turning full control of Kahoolawe over to the state, ending a 10-year, $460 million cleanup of unexploded ordnance. KAHOOLAWE » The Navy completed its hand-over of this former island bombing site yesterday, withdrawing personnel and equipment and fully transferring power to the state after a 10-year, $460 million cleanup. The last barge full of equipment and scrap was leaving Kahoolawe yesterday, and work by its contractor, Parsons-UXB, which coordinated cleanup efforts, ceased. Rear Adm. Barry McCullough, commander of Navy Region Hawaii, made a final trip to the island, assessing work and thanking staffers. "I'm glad the Navy did what it was chartered to do," he said. In all, 12.9 million pounds of scrap metal have been towed off Kahoolawe since the actual cleanup began in 1997. According to the Navy, 22,214 of Kahoolawe's 26,158 accessible acres were cleared on the surface of ordnance, fragments and scrap metal. Only 2,650 acres were cleared up to four feet below ground. Stanton Enomoto, acting executive director of the state's Kahoolawe Island Reserve Commission who met McCullough on the island, said he was pleased with the Navy's work. "They did what they could," he said, "but as long as there's ordnance here on the island or even in the water, there's a responsibility of the government. There's work to be done." Other native Hawaiian groups have been more critical of the government's presence on the island and its commitment to clean it up. Kahoolawe is sacred to native Hawaiians who feel the island connects them to their ancestors. The island will be set aside for cultural, education and archaeological activities, with no commercial development allowed. The 45-square-mile island was used by the Navy as a target and training area from 1941 until 1990, when President George H.W. Bush ordered a halt to the exercises after years of protests and lawsuits by Hawaiians. Congress agreed in 1993 to clean up the land, and the island was returned to local control on Nov. 11. The Navy and its primary contractor, Parsons-UXB Joint Venture, would return to clean up any dangerous materials found in the future.